Pic The Philae lander’s science centre has had its first data update from the spacecraft, which has sent the first of many images, along with data, from its scientific instruments. El Reg's space vulture Brid-Aine Parnell reports from mission command at the ESA ops complex at Darmstadt, Germany. The European Space Agency team that’s looking after the ÇIVA camera has reported that the lander is working fine, with the descent on track. “We have all the data we were waiting for,” the team said from its base in Toulouse. 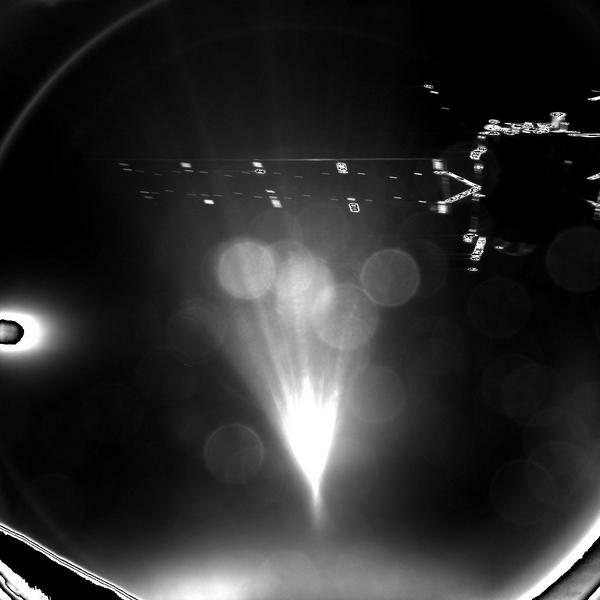 The first picture was taken just 50 seconds after Philae's release from Rosetta and shows one of the satellite’s solar panel wings, the craft itself, and the Sun in the distance. The data is the first to be received from Philae as it drifts down to its historic rendezvous with Comet 67P/Churyumov-Gerasimenko. The lander was released from the comet-chasing Rosetta craft early this morning and is hoping to touch down on its three ice-screw lander legs with the help of its harpoons at around 4pm GMT today, Wednesday. ÇIVA is one of two camera instruments on the lander, with six identical micro-cameras that will take panoramic pictures of the surface of the comet, while a spectrometer studies the composition, texture and reflectivity of samples taken. The other is ROLIS (Rosetta Lander Imaging System), a CCD camera that will take high-res images during descent and stereo panoramic images of areas sampled by other tools onboard the lander.